When I first arrived to Bologna, I was surprised to see so much senseless tagging on the city’s historical centre. There where colourless scrawlings devoid of any aesthetical sense plastered all over the place. It took me some time to find the more interesting pieces, those unique works that fuel my search for urban art everywhere I go. 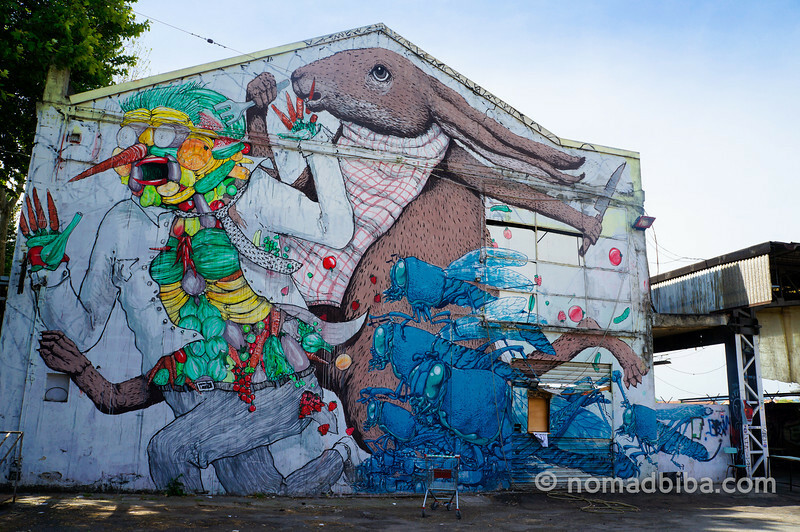 This time, I was after something in particular: I wanted to see murals by local artist Blu. It was during one of my first visits to Berlin that I first came across Blu’s gigantic murals. His works took my fascination with street art up to a whole new level. When I knew I was going to spend some time in Bologna, Blu’s hometown; I was looking forward to see and photograph as much of his impressive murals as I could find. What I like most about Blu’s work is not just the style and originality of his designs, but also his not so subtle social critique. More often than not, his murals play around with the failings of our modern society; depicting humanity in some of its less brilliant moments. But Blu doesn’t stop at the images that get frozen in time for his murals, he has experimented and gained praise with videos as well. For a sample, check out the one below; in which he gives us a glimpse of evolution through his paintings. Also, in Bologna I got to see a couple of works by Blu in collaboration with another street art master, Ericailcane; I was familiar with his work from photographs, but this was the first time I saw his murals “live”. His style is also very particular as he fills his murals with dressed up animal figures in surreal situations with a humorous twist, such as the one below. Now, coming across these murals required some research as they are well off the usual tourist path in Bologna and outside the walls of the historic center. To help me on my quest for big murals, I had the support of my friends from BlogVille, who put me in touch with Claudio Musso, one of the curators of Frontier; a project focused on promoting street art in Bologna that is promoted both by the city and the Emilia-Romagna region. There are two phases for this project, the first just finished last month with the creation of 13 artworks in big walls on buildings around the city by both local and international artists. The second phase will take place in Bologna on January 2013, where an international symposium will be held at the MAMBO, one of the entities backing up this initiative. For some images of the finished walls, check out Frontier’s Facebook page. With a project like Frontier, Bologna aims to be at the forefront as a centre of aesthetic production that involves street art, one of the more interesting phenomenons in today’s contemporary art landscape. After my conversation with Claudio, I thought that experiencing these big murals in person could very well be the reason that will bring me back to Bologna. We’ll see. 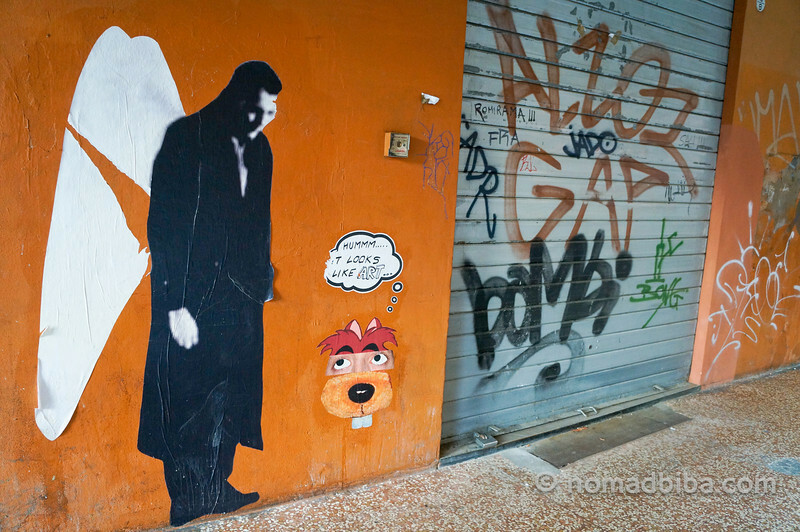 In the meantime, check out my gallery for more Bologna street art and the rest of my photos of this lovely city. During part of my stay in Bologna, I was hosted by BlogVille; a project from the Emilia-Romagna Tourism Board for which bloggers were invited to explore what the region has to offer to visitors. They also kindly provided me with a bicycle so I could get around effectively while looking for street art to photograph. A big thank to all who helped me craft this post!